I'm always looking for ways to speed up my website and make it load faster for visitors who are connecting to it. Webmasters can use many services to determine the connection speed of their website and most optimize images which seem to be the biggest files on most websites these days. I took a look at an online service called Web Page Optimizer a few months ago which simulated a visitor's loading time on it listing all items, images or scripts for example, that were loaded during the process and how long it took for each to load. The script displayed general recommendations and tips on reducing the loading time of the analyzed page as well. While this script is great for a quick overview it did not give in depths recommendations and many webmasters had to research ways to optimize their webpages on their own. Yslow is a Firefox add-on by Yahoo that makes use of the popular Firebug add-on. Once installed id displays a small icon and the loading time of the website in the statusbar. If a webmaster clicks on the icon a performance report will be generated and displayed afterwards using the Firebug interface. 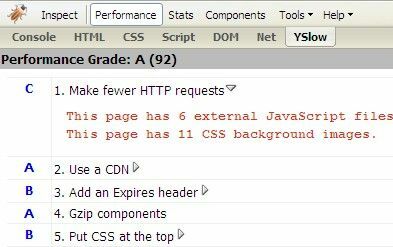 It rates the performance of your website from grade A to F and displays individual elements and their score below. Those individual elements are always the same and only the grade of the website that you are optimizing differs. A Yahoo developers website will load if you do click on the element directly offering in-depth information about the subject. It contains tips and external links that explain how to optimize this element further. There is naturally no need for optimization if you received an A but an F should at least cause some concern. One entry however is not aimed at the normal webmaster but at businesses. Use a CDN (content distribution network) is not normally an option for most webmasters because using one costs lots of money. The stats link displays some interesting information as well. It compares the total size and http requests of an empty cache to an primed cache. Empty cache means users who have not been on your website before while primed cache means that they have been there before and still have some files in their browsers cache which speeds up page loading time. What I really like about YSlow are the explanations on the Yahoo website. They are good to read and easy to understand and contain a wealth of information. Update: You can use a service like GTmetrix instead if you don't use Firefox or Firebug. It is an online service that checks the performance of your website using Yslow and other services. It displays the same information to you but can be used in any modern browser. If you are running a website you can use the YSlow add-on for Firefox to test its performance to list areas that could be improved. hmm… seems pretty good. will try it. helped me out alot, thanks! Hmm… It seems very interesting. I’ll give it a try.